Home › Keith Weiner: Gold Standard etc. › How Could the Fed Protect Us from Economic Waves? 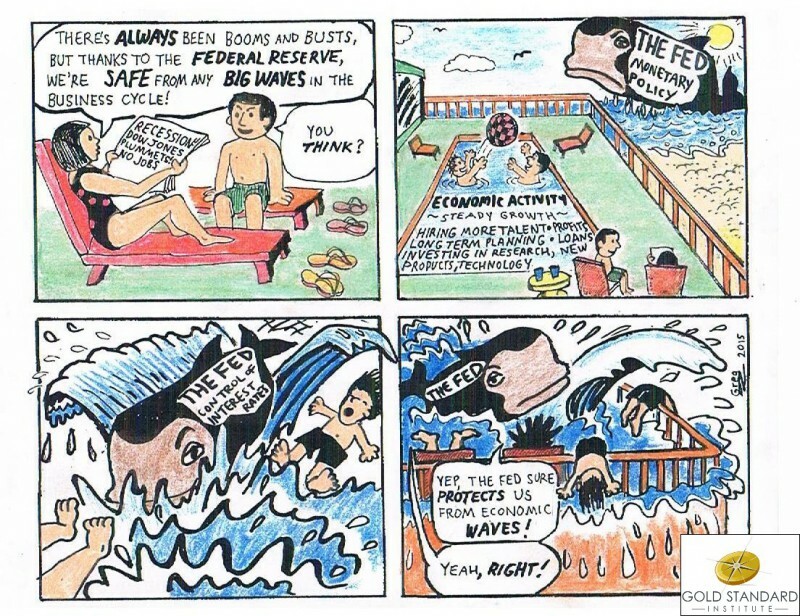 How Could the Fed Protect Us from Economic Waves? Mainstream economists tell us that the Federal Reserve protects us from economic waves, indeed from the business cycle itself. In their view, people naturally tend to go overboard and cause wild swings in both directions. Thus, we need an economic central planner to alternatively stimulate us and then take away the punch bowl. Prior to the global financial crisis of 2008, a popular term described the supposed benefits created by the Fed. The Great Moderation referred to the reduced volatility of the business cycle. For example, I have written before about economist Marvin Goodfriend, who asserted that the Fed does better than the gold standard. This belief is inherent in the Fed’s very mandate from Congress. The Fed states its three statutory objectives as, “maximum employment, stable prices, and moderate long-term interest rates.” These terms are Orwellian. Maximum employment means five percent of able-bodied adults can’t find work. Stable prices are actually rising relentlessly, at two percent per year. The meaning of moderate long-term interest rates must be changing, because rates have been falling for a third of a century. That aside, the basic idea is that the Fed has both the power and the knowledge to somehow deliver an economic miracle. However, we know that central planning never works, even for simple things such as wheat production. Communist states have invariably failed to produce the food to keep their people alive. Stalin, Mao, and other communist dictators have deliberately starved off segments of their populations that they couldn’t feed. The business cycle is vastly more complicated than the crop cycle. It plays out over decades. It involves every participant in the economy. It affects every price, including, especially, the price of money. It causes changes in how people coordinate in the present and how they plan for the future. And, there are feedback loops. Changes in one variable cause changes in others, which come back to affect the first variable. The very idea of centrally planning money and credit boggles the mind. Is it true that the Fed is actually somehow providing stability, or even improving on a free market? Let’s look to the interest rate on the 10-year Treasury bond. The rate of interest is a key economic indicator. With that giant peak on the right side of the graph, we can immediately reject all claims to Fed-imposed stability. Now let’s label a few key dates. The pre-Fed period is pretty stable. Two spikes occur due to wars that we know disrupted the economy—and they’re pretty small, considering. Interest declines to a lower level when the government was paying down its war debt. Things remain stable until the creation of the Fed. After that, we get a rise, a protracted fall, an incredible and truly massive rise, and an endless freefall. Both rising and falling interest make it more difficult to run a business that depends on credit, such as manufacturing, banking, or insurance. The post-Fed period is a lot less stable than the pre-Fed. A feature of the free market and its gold standard is interest rate stability. The rate can vary between the marginal time preference and marginal productivity. This tends to be a stable and narrow range. Fed apologists argue that the economy would be even more unstable, if we had no monetary central planner. However, the fact is that it became a lot less stable after the Fed was created. 1918 – The market for gold-denominated bills in London — the “clearinghouse of the international gold standard” — is shut down, after the end of World War I. Naturally, this was followed by an increase in interest rates, as US companies — who before could finance exports using the clearing instrument that was the Real Bill — were now forced to obtain capital via the credit market instead. 1922 – The Federal Reserve performs its first “open market operation”. Previous to this date, no central bank had ever intervened directly in the open market. Traditionally, a central bank functioned as a lender of last resort and clearinghouse for commercial banks. Since the US Dollar was backed by gold back then, the practice of the Federal Reserve issuing liabilities (dollars) and purchasing Treasury notes constituted fraud, since the Federal Reserve was knowingly issuing liabilities that it was unable to fulfill. This practice, however, succeeded in pushing down interest rates, thus concealing the effects of US companies no longer being able to finance exports using the gold bill. In 1929, this bubble burst, once again forcing the people of the United States to face the fact that exports could no longer be financed using the clearing instrument that is the gold bill, but only through credit, which was a lot more expensive.